Things I Love Thursday – Vegan MoFo Edition 1 – vegan in your city. Sure sure, it’s been only a few days of Vegan MoFo. How do I have things I love already? Easy. Vegan Mofo is pretty incredible, with so many wonderful vegan bloggers coming together to share all their different stories and recipes and reviews and hot tips and whatever. Like I said in my intro, I wanted to use my usual Things I Love Thursday post to share some of my favourite posts and themes of the week. I love travelling, and we went to New Orleans in December, so I’m loving the posts from Laughfrodesiac, especially focusing on New Orleans (this week) and a new theme and location every week. Mary’s Test Kitchen – An entire month of Vegan Cultured Cheese WITH video. Yes, an entire month of vegan cultured cheese videos. Amazing. A 10 year old lifelong vegan’s blog – Peace, Love, Be Vegan – her theme is “How This Kid Gets Protein” but frankly, I’m just really jazzed to see a young vegan blogger, and what she’s eating. DIYLettante is doing a month of vegan Jewish Food, which is awesome, because September contains a high holiday (I’m looking at you Rosh Hashana), and it’s always great to have new ideas. Say you like following along with Vegan Travel – well, Vegan Nom Noms is in the middle of a Vegan Roadtrip right now, so I’m following along in nostalgic roadtrip fashion. It’s awesome to see someone visiting some of the same cities… but yet finding totally different places to actually visit inside the city. Also, I like the extra coop info/”places to buy groceries” info she’s been sharing for some places. Hana Low is taking the SNAP challenge for VeganMoFo and Hunger Action Month. Where she will be taking the SNAP Challenge and will try to live within the Supplemental Nutritional Assistance Program budget of around $4.50 per day which is the average benefit in Colorado where she lives. Mammi is covering Finish Coffee Table culture, which I have never heard of, and am interested in learning more about. AND has made me want to make Pulla dough sometime to try out some of these recipes. Speaking of recipes… in addition to the ones I’ve mentioned above, a few recipes I saw in the past few days really stood out for me. And besides these, there are so many great ideas and recipes going on, it’s hard to pick. Check out VeganMoFo’s own recipe round up for lots of yummy looking things. 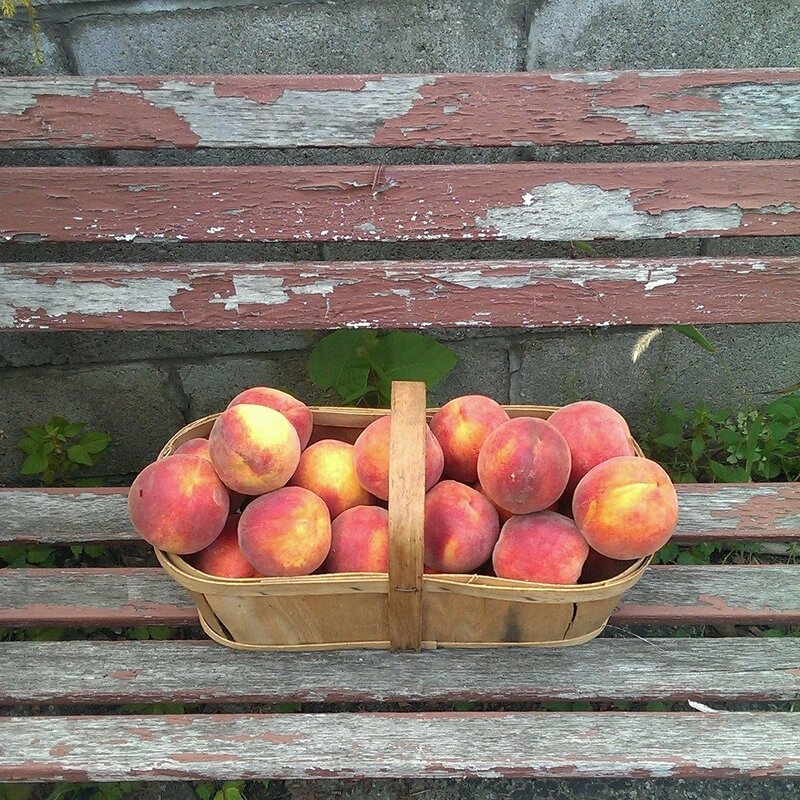 We bought a 7L basket of peaches from West End Food Coop this week, so this recipe for a Peach Pie Smoothie from Connoisseurus Veg did it for me. I don’t have much of an appetite this week, but peaches are still on the LOVE list. I sent this recipe over to JC yesterday, and we almost immediately went (at 11 pm) to the grocery store pick up some avocados so we could eat it this morning. Forks and Beans posted a Raw Lime Coconut Pie, and I really really love lime and coconut pie, and I might even make this this month. Vegan Corn Dogs from Hell Yeah it’s Vegan. I want to make these, I do, but I’ll probably have to wait until Hanukkah when I have a pot full of oil waiting for sufganiyot (aka donuts). First donuts, then corn dogs. Luckily Hell Yeah It’s Vegan also has a recipe for those too. What is your favourite VeganMoFo find so far? Biscuits, Finish Coffee Table, Jewish Food, Laughfrodesiac, Marys Test Kitchen, Peaches, SNAP Challenge, Things I Love Thursday, Vegan Cheese, Vegan Gravy, Young Vegans. Bookmark. I haven’t looked at as many posts as I would have liked so far, but I am excited to see all that comes out this month. And I have seen a couple of things already that look yummy and would love to try. Thanks for this posts. It gives me something to check out! Ooh, thank you for this round up. There’s loads of interesting blogs on there I hadn’t come across yet. I really want to start cheese making so I will follow that one with great interest! Such a great TILT, I’m travelling right now and it’s hard to keep up with everyone’s mofoing so round ups like these are totally perfect. Thank you! I also saw the Finnish baking blog and thought it looked great. I’ve been posting a few on Facebook every day becasue I can’t keep track of all the good stuff I’ve found. Kind of hard to even decide, there is so much good stuff going on this year. Wow that pie looks heavenly. I love the Dumbledore’s Vegan Army idea- anything Harry Potter really! I wonder how they would do a blood pudding? Interested to see! If anyone can do it, they can! I was so happy to see they were doing Vegan Mofo again this year! Wow! You really found some cool posts and blogs! I didn’t know about most of these so thanks! Thanks for having such a lovely blog Anzia! I’ve been really enjoying it so far. Pingback: Things I Love Thursday – Vegan MoFo Edition 2 | meshell in your city. Aww, thanks for the shout out and for the tips! You totally found some awesome posts I completely missed! I’ve enjoyed your roadtrip posts a lot!